Wheelbarrows have been part of our civilization for a pretty long time, and it is so for fairly good reasons. Having an assistant to make your work easy can be among the best things you could get when out working things out in the field or otherwise. Hauling soil, sand, concrete stone would be a very difficult task had the wheelbarrow not been around. Imagine if you would have to carry these things on your back or bare hands, difficult is it not? But that is why technology exists, to make our lives easier and that is what the wheelbarrow has done. However, all this said, not every wheelbarrow is a good wheelbarrow, and it is important that when you are on the search for one, that you consider well the effectiveness and features the product has before buying it. 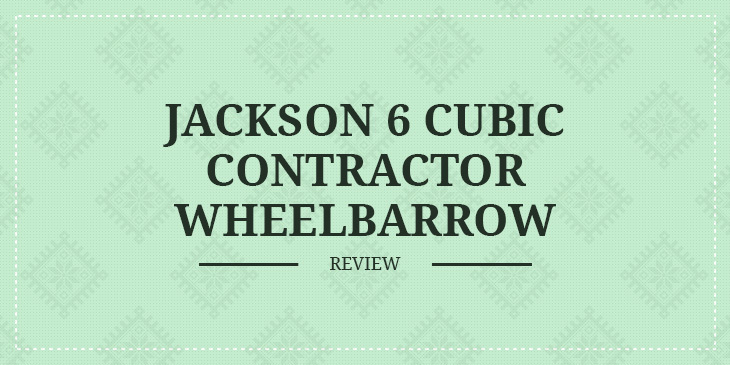 The Jackson 6 cubic contractor wheelbarrow is the wheelbarrow to have if the best is what you are out for. The tray of a wheelbarrow can tell whether the wheelbarrow is just an everyday wheelbarrow or it’s one made with thought and concern put into it. The Jackson 6 cubic contractor wheelbarrow is made with a tray that is seamless to prevent dirt and material getting stuck in crevices that make it impossible to reach those places to clean the wheelbarrow. It also has front braces that support the weight if the tray and keeps it firm even when the load being hauled is a big one. Reinforcement is important in any wheelbarrow to make sure it doesn’t break under the weight of heavy material or in rough rocky terrain. This calls for extra measures in the construction to ensure this is made possible and taken into consideration. This product is made with an H brace which is supported by tough steel cross strips to keep the wheelbarrow and firm and sturdy. Aside from this, it has leg shoes that support it when at resting position. The tires a wheelbarrow is made of, need to be ones that can stand the rough and tough conditions of either the farm, construction or any physical working environment that involves wheelbarrows. Otherwise, they would wear out and tear in no time. Therefore, this product is made with 16-inch tube tires that are more than good enough to take the shocks and pressures that come with this kind of work. You never have to worry about replacing your tire all the time due to wear or tear. How much material can this wheelbarrow carry is a question anyone buying one needs to ask themselves. Does this one correspond with the amount of material that you intend to carry or haul or is it too small or too huge? It needs to be one that’s about what you are ready to carry. The Jackson 6 cubic contractor wheelbarrow can haul six cubic foot at a time which is enough for the average amount of material carried or hauled by most wheelbarrows. Far from performance, a wheelbarrow is supposed to be made to last long, to be durable. The user should not get problems of having to replace it after every small period because either it broke down or was damaged due to wear and tear. This same reason is why the Jackson6 cubic contractor wheelbarrow is made with a tray that is made of heavy duty steel to maintain durability and increase the lifespan of the wheelbarrow many times over. Q: Concerned about shipping, is the packaging improved? I don’t want to receive a scratched item. A: Arrived in perfect shape! Q: Can a bicycle pump be used to refill the tire? Q: Is the tire solid or air filled? A: Air filled, and it came deflated. This wheelbarrow has a lot of thought put into its construction and thus it would be highly recommended for anyone looking to buy a wheelbarrow or shopping for one. I would buy it myself; it’s an incredible product. 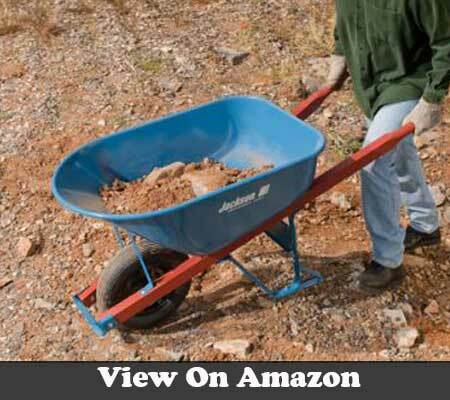 Buy Jackson 6 Cubic wheelbarrow on Amazon, Now!